Worried the current U.S. stock market run won’t last? The following chart of the S&P 500 by First Trust illustrates the value of investing for the long-term and staying the course in a long-term investment strategy. Of note, the average bull market lasted approximately 9 years with an average total return of 468%, with the longest bull market lasting 15 years. The average bear market lasted approximately 1.5 years with an average total return of -41%. 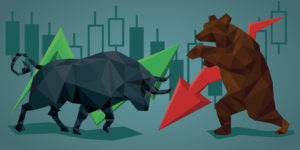 Therefore, while bear markets are painful when we experience them, the ensuing bull markets tend to be longer in duration and the returns/gains more than make-up for the previous losses. Also note that this chart shows how being invested solely in large U.S. companies would have performed. A more globally diversified investment strategy that includes small U.S. companies, international companies, bonds and other asset classes, has historically reduced the volatility of a portfolio to help you achieve your goals.